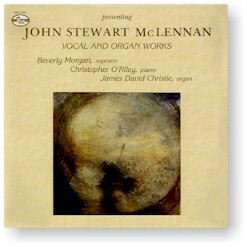 John Stewart McLennan’s music has a distinct personality and offers well-crafted, conservative styles. The skillfully composed songs work to illuminate the texts of Joyce and Sitwell. Beverly Morgan, soprano; Christopher O’Riley, piano; James David Christie, organ. Recorded on (1: #1-6) 8 October 1981 at Dimension Studio; (1: #7, 2: #1-3) 3 November 1981 at the Church of the Advent in Boston, Massachusetts.